Olympian, America’s Cup sailor, National Sailing Hall of Famer, and our company founder, Steve Colgate, knows why winning teams work so well together. He and his team of expert coaches have combined their knowledge and experience to develop highly successful sailing team building programs. On a sailboat, very different personalities learn how to work together to accomplish a common goal. Good leadership skills are developed, trust and respect are fostered. Other corporate team building events test survival skills, and segregate participants by detecting weaknesses and inabilities. Not so of sailing. Anyone, of any age, any size and strength can participate in a Corporate Sail-Race Challenge because sailing is forgiving. Everyone aboard learns to work together, take and give commands, share the goal of maximizing the sailboat’s potential. Offshore Sailing School coaches and facilitators specialize in teaching people how to sail successfully. 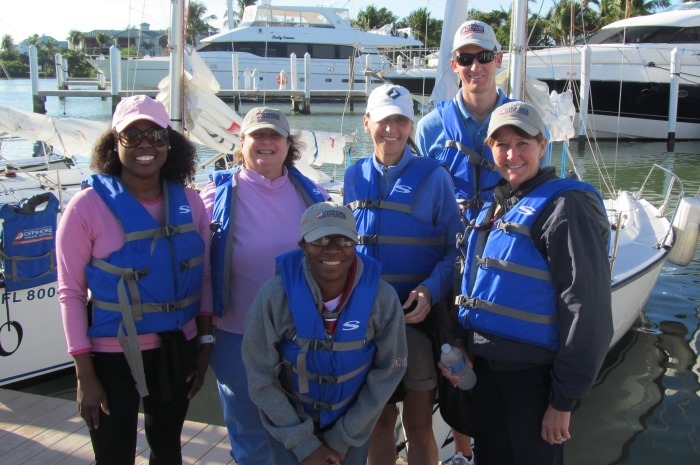 Whether your group includes people who are avid sailors or boating novices, young or old, fit or not so fit, they are encouraged to participate and learn equally. 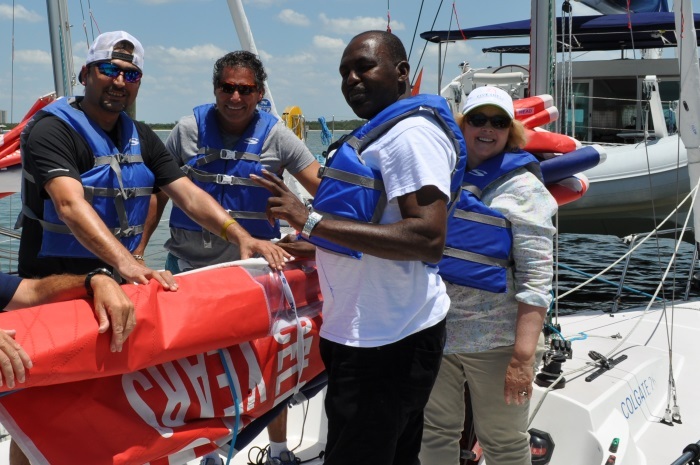 After just a few hours into the sailing team building schedule everyone gains comfort and confidence aboard, discovering how to work as a team, as skipper and crew – to capably reach the finish line in a fun sailboat regatta at the end of the program. Contact us and ask about our corporate team building events today! Maximizing a sailboat’s performance is remarkably similar to maximizing a company’s performance. Each boat is assigned a team of four or five participants with an expert Offshore Sailing School coach. Each team member rotates as captain and crew. Company executives remark over and over how amazing it is to experience taking orders from an employee when they are tasked with crewing instead of leading during our corporate team building events. Employees discover how challenging it is to be in the driver’s seat. This all results in renewed respect for one another. 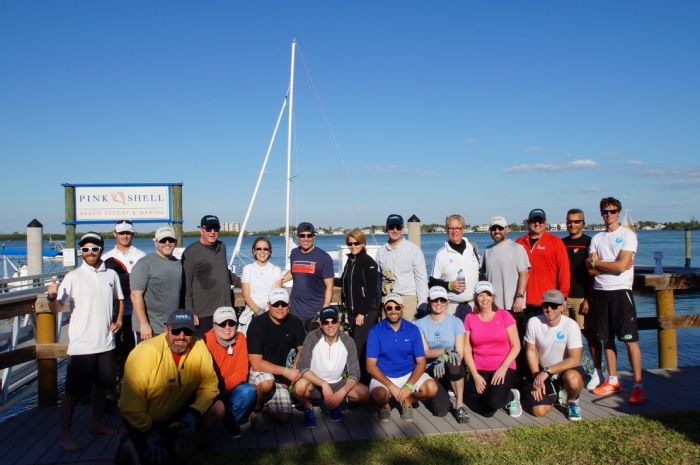 A perfect example of how team members on a sailboat motivate each other occurred in a half-day sailing team building program with Interstate, a resort management company. On one of the boats, a team member was reluctant to take the helm at her appointed time. Her co-workers encouraged her to move from “no” to “sure” and that boat won the race! This is what team building is all about – encouraging and trusting one another to successfully produce results. Contact us to learn more about our corporate team building programs. Our sailing team building courses can be a half day, full day or multiple days. No matter the length, the same goal of creating a group mindset can be achieved. Our instructors are schooled in facilitating on-water issues and relating those back to pre-stated goals in debriefs after sailing. Programs are tailored to your individual needs. Please call 888-454-7015 for a quote.